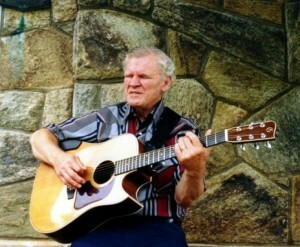 Grammy-winning folk musician Doc Watson has regained some strength after undergoing colon surgery at a North Carolina hospital. Agent Mitch Greenhill of Folklore Productions said in an e-mail Friday that Watson is resting and responsive following the surgery Thursday at Baptist Hospital in Winston-Salem. A hospital spokeswoman said he remained in critical condition Friday afternoon. Watson’s daughter (Nancy) told the Associated Press that the 89-year-old Watson fell Monday. He’s known as a master of the flatpicking style of guitar playing. He also started Merlefest – an annual gathering of musicians in Wilkesboro named after his son, who died in a tractor accident in 1985. “He came through that pretty well” – Mitch Greenhill, of Folklore Productions, Intl., said today. Watson (89) is still listed in critical conditions, because he is in the hospital’s intensive care unit. “It’s critical, but we’re all feeling a lot better than we did at this time (Thursday)” – Greenhill said this afternoon. Watson became ill and fell down at his home in Deep Gap earlier this week – according to the Times. He was taken to the hospital in the nearby town of Boone, but was sent to the medical facility in Winston-Salem when doctors determined he needed surgery to remove a blockage in his colon. A statement on Folklore Productions International’s website said Watson was “resting and responsive” following his surgery, reported Reuters. “The family appreciates everyone’s prayers and good wishes” – the statement said. The blind singer and guitarist has won several Grammys, including a lifetime achievement award, according to the Associated Press. He is known for being a master of flatpicking and for starting Merlefest, a gathering of musicians named after his son, who died in a tractor accident in 1985. This entry was posted on Sunday, May 27th, 2012 at 7:48 am	and is filed under Celebrities. You can follow any responses to this entry through the RSS 2.0 feed. You can skip to the end and leave a response. Pinging is currently not allowed.